Context? The International Museum Day is celebrated this week around the world. 2017’s slogan is "museums and contested histories: saying the unspeakable". What? 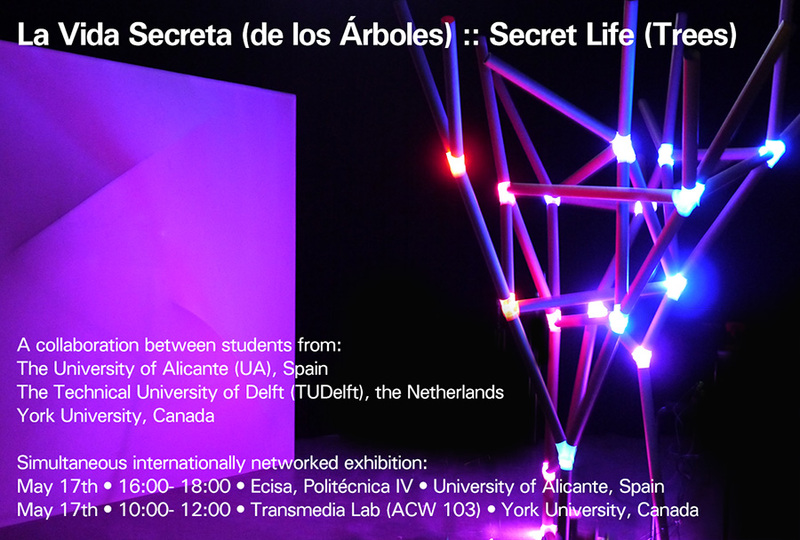 “Secret Life (Trees)” is an improvised networked double show-room focus in the “Saying”: how to organize a non-evident visual language between two tiny open-labs separated some thousand kilometres, in which artificial natures breathe and transfer responses to people attending to real and virtual components. Where? Circus Room, Alicante Polytechnic School (Spain) + Transmedia Lab, ACW103 (York University, Canada). Who is involved? Students and teachers from TUDelft, (the Netherlands), York University (Canadá) and Alicante University (Spain); UA Viceversos Research Network; Departamento de Expresión Gráfica, Composición y Proyectos, UA. Goal? The goal is to ask "can we sense the presence of others without sight, sound or touch?" by exploring the potential of interacting with people in distant locations without relying on raw sound or image (e.g. Skype and others). Any inspiration? Peter Wohlleben, a forest ranger has found and described that trees communicate to each other, share nutrients, protect themselves with electrical signals through a symbiotic fungus interaction ("The Hidden Life of Trees”, 2016). We have performed this communication with a kind of soft components affecting two artificial trees, one in Alicante and the other in Canada.